British Prime Minister Theresa May gives a press conference outside Downing Street in London on Tuesday, April 2, 2019, after Cabinet ministers held a two-part meeting in Downing Street. With Britain racing toward a chaotic exit from the European Union within days, Prime Minister Theresa May veered away from the cliff-edge Tuesday, saying she would seek another Brexit delay and hold talks with the opposition to seek a compromise. May made the announcement after the EU's chief negotiator warned that a disruptive and costly Brexit was likely unless Britain broke the impasse that has paralyzed the government and Parliament. 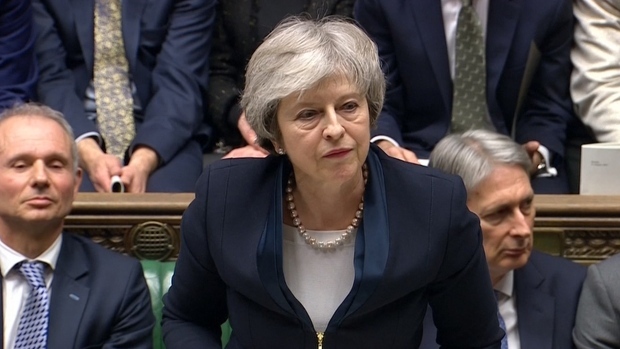 After failing repeatedly to win Parliament's backing for her Brexit blueprint, May said the country needed "national unity to deliver the national interest." 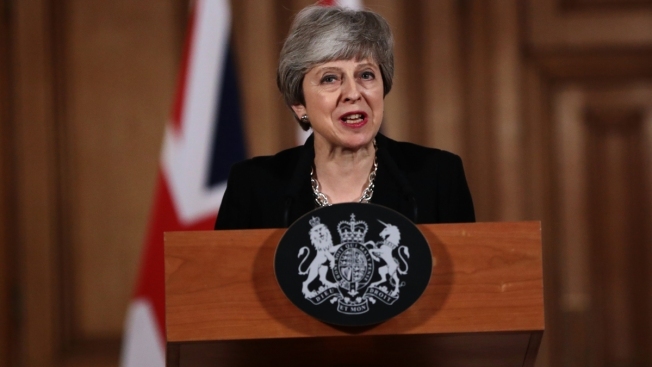 Following the defeat of the government's plan and a range of lawmaker-written alternatives, May said Britain would need a further delay to its EU departure, currently scheduled for April 12. She offered to hold talks with opposition Labour Party leader Jeremy Corbyn in an attempt to find a compromise solution. "This debate, this division, cannot drag on much longer," May said in a televised statement from 10 Downing St. after an all-day Cabinet meeting. European Council President Donald Tusk gave a cautious welcome to May's change of course. "Even if, after today, we don't know what the end result will be, let us be patient," he tweeted — a suggestion the EU would wait for Britain to present a clear plan. Earlier, EU negotiator Michel Barnier offered a downbeat assessment of the situation. "As things stand now, the no-deal option looks likely. I have to tell you the truth," Barnier said in Brussels. Barnier said "we can still hope to avoid it" if London produced a breakthrough before an April 10 EU summit. 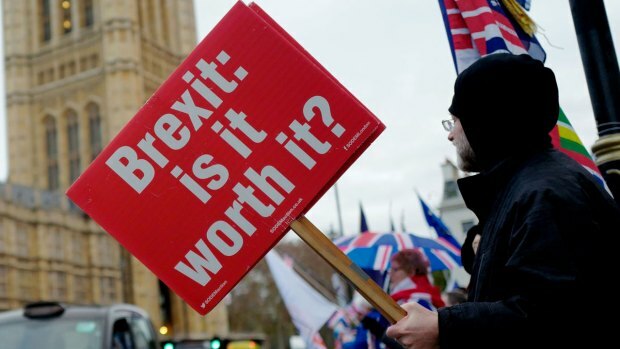 The leaders of the EU's 27 remaining countries have given the U.K. until April 12 to leave the bloc or to come up with a new plan, after British lawmakers thrice rejected an agreement struck between the bloc and May late last year. The House of Commons has also failed to find a majority for any alternative plan in two days of voting on multiple options. 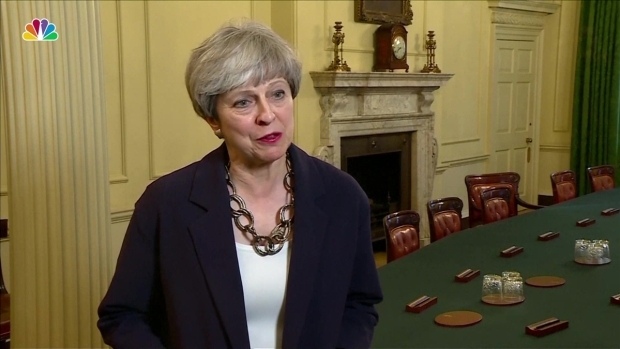 May's statement came after a seven-hour meeting of her fractious Cabinet, which is split between supporters of a "soft Brexit" that keeps close economic ties with the EU, and Brexiteers who believe a no-deal exit is better than compromising. May's words seemed to indicate that she was veering away from the possibility of a no-deal Brexit — but also that she has not given up on her own unloved withdrawal agreement. Her plan is to seek approval for the legally binding agreement — which sets out in detail the terms of Britain's departure from the EU — after securing cross-party political support for a vision of future ties between the U.K. and the bloc. If she and Corbyn fail to reach agreement, May said Parliament would get to vote on a range of options — and the government would be bound by the result. It is the first time she has committed to following the instruction of lawmakers. May didn't indicate how long an extension she would seek from the EU, though she said she hoped Britain could pass the agreement by May 22, in time to avoid participating in elections for the European Parliament. Corbyn said he would be "very happy" to sit down with May, even though "so far she hasn't shown much sign of compromise." Corbyn said Labour would present May with its conditions for Brexit, which include a close economic relationship with the bloc through a customs union, maintaining high environmental standards and protecting workers' rights. May's move infuriated pro-Brexit politicians, who say Britain must cut ties to the EU in order to forge an independent economic policy. "I think people will feel very short-changed," said former Foreign Secretary Boris Johnson, a prominent pro-Brexit voice in Parliament. 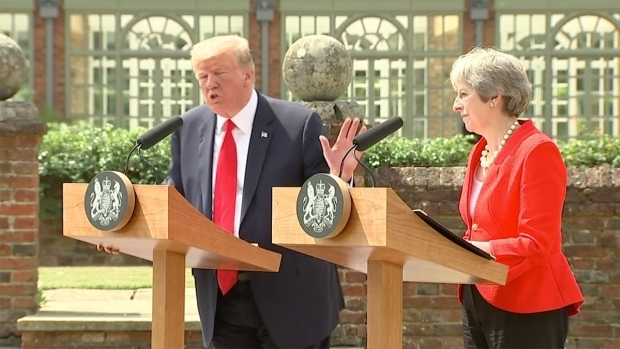 But May's words brought relief for those who fear the effects of a no-deal Brexit, which would complicate trade and travel, with new checks on borders and new regulations on dealings between the EU and Britain. Businesses have warned that the economic impact in Britain could be devastating. Ford of Europe Chairman Steven Armstrong said "a no-deal Brexit would be a disaster for the automotive industry in the U.K."
Edwin Morgan, interim director general of business group the Institute of Directors, said May's statement was "a welcome step towards compromise," though there remained obstacles ahead. "We urge the leader of the opposition to work with the prime minister to find a solution," he said. "Both sides must play ball." Britain's political paralysis — and May's failure to get Parliament's approval for the withdrawal agreement she negotiated — have exasperated EU leaders. French President Emmanuel Macron said that if Britain's politicians could not agree on a way forward, "they will de facto have chosen for themselves to leave without a deal." "We cannot avoid failure for them," Macron said before a meeting in Paris with Irish Prime Minister Leo Varadkar. But Varadkar stressed "there's still time" for May to come to the April 10 summit with "credible" proposals. Meanwhile, British lawmakers intent on avoiding a no-deal Brexit have drawn up plans to prevent Britain crashing out of the bloc, by accident or design. "We are now in a really dangerous situation with a serious and growing risk of no deal," Labour Party legislator Yvette Cooper said. Cooper introduced legislation, which Parliament is set to consider, this week, that would compel May to seek to extend the Brexit process beyond April 12 in order to prevent a no-deal departure. Mike Corder contributed to this story.